The Scottish secretary has said he is determined to stop a no-deal Brexit, but has no intention of leaving the Conservative Party. Speaking at an event in Edinburgh, David Mundell said leaving the EU without a deal could cause "chaos and disruption in our economy". He said he was not surprised that three pro-Remain Tory MPs had quit the party to join the new Independent Group. But he said he would "most certainly not" be joining them. 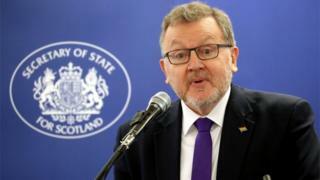 There have been reports that Mr Mundell, who backed Remain ahead of the EU referendum, has threatened to quit the cabinet next week unless no-deal is ruled out. According to ITV's Robert Peston, he was one of nine ministers who made the warning during meetings with Prime Minister Theresa May on Monday. The nine are said to have urged Mrs May to ask the EU to delay Brexit if it looks like she will not be able to get a deal through parliament before the UK leaves on 29 March. Mr Mundell said he would not comment on private conversations he has had with the prime minister. But he added: "What I have said to her repeatedly is that a no-deal Brexit is a very bad deal for Scotland and the United Kingdom and that we must do everything that we can to avoid that outcome." Asked if he would leave the the party or the cabinet in the event that a no-deal Brexit becomes the government's position, he said: "I'm most certainly not leaving the Conservative Party." He also said he did not want to be "part of the soap opera psychodrama of people threatening to resign". It comes amid speculation that more MPs are likely to quit both the Conservatives and Labour in order to join the Independent Group in the Commons. The group, which says it wants to reclaim the political "centre ground", was formed by eight Labour MPs angry about their party's handling of Brexit and anti-Semitism. They were joined on Wednesday by three pro-Remain Conservative MPs who accuse the party's leadership of allowing right-wing hardliners to shape its approach to Brexit. Mr Mundell told BBC Scotland that he was "disappointed but not surprised about the people who left" the Conservatives, and said he hoped they could return to the party in the future. But he said the best way to avoid no-deal was to vote for the prime minister's deal. He said the prime minister's proposals would allow the country to leave the EU "on an orderly basis" and provide "a future trading relationship with the EU that allows our businesses to continue to trade without tariffs without additional bureaucracy". The Scottish government published an analysis paper on Thursday morning which repeated its warnings about the potential impact of a no-deal Brexit on Scotland, which it said could push the country's economy into recession. The paper suggests Scotland's Gross Domestic Product (GDP) could fall by up to 7% and trade with the EU could also be "significantly impaired", with a forecast for a potential drop in Scottish exports of between 10% and 20%. Mr Mundell said he agreed that no-deal would be "extremely bad for Scotland", adding: "It has the potential for chaos and disruption in our economy and I believe actually it is a threat to the United Kingdom. "That is why we need to stop it, and that is why the Scottish government's SNP MPs at Westminster need to vote to stop a no-deal. "There is no point saying a no-deal is really bad for Scotland and then doing everything you possibly can to bring it about. I'm determined to stop it." He claimed the SNP realise a no-deal Brexit is a "threat" to the unity of the UK and "that's why they are contriving to bring it about, by, on every opportunity, supporting a no-deal Brexit in votes". The SNP argues that the country is not facing a straight choice between Mrs May's deal and no deal, and that other options are still possible - including holding another EU referendum. The party's deputy leader, Keith Brown, said: "David Mundell is perfectly content with imposing a hard Brexit on Scotland against our will - while making a powergrab on areas the Leave campaign pledged would come directly to Holyrood. "After Theresa May trampled all over David Mundell's self-declared red-lines, if he had any credibility he would have resigned months ago."